Dr. Lapsley is an internationally known author, winemaker, and instructor. His main areas of research are the economics of wine production and marketing, and the history of California wine. Lapsley has authored Bottled Poetry, a history of the emergence of the Napa Valley as it evolved into California’s premiere wine region. He co-edited, along with Kirby Moulton, Successful Wine Marketing, which was awarded the OIV Grand Prize in 2001 for the Best Book on Wine Economics. Lapsley was President and Winemaker for Orleans Hill Winery from 1980-2002, a winery that specialized in wine produced from organically grown grapes. In 2003, Lapsley was a Fulbright Scholar in Uruguay, where he collaborated with faculty in the Schools of Chemistry and Agronomy to create a much needed degree program in enology. 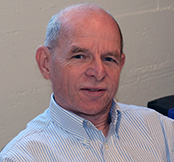 Until his retirement in 2009, Dr. Lapsley was Chair of the Department of Science, Agriculture, and Natural Resources within the University of California Davis Extension Program where he developed and administered courses for more than 10,000 continuing education students each year. Since 2009 he works as a researcher at the University of California’s Agricultural Issues Center, where he studies economics regarding grape and wine production. He also serves as an Adjunct Associate Professor in the Department of Viticulture and Enology.